Discussion in 'General Chatter' started by alice&bump, Oct 6, 2008. WTF??!! just heard on the news that pizza hut is changing its name to pasta hut to promote healthier eating!! isnt that false advertising, seeing as they sell mainly pizza?? 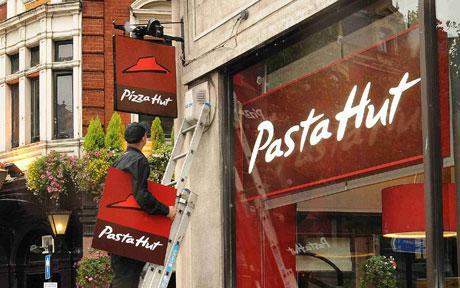 PIZZA HUT has announced it is to rename 30 of its branches Pasta Hut as part of an £18 million revamp package designed to attract new customers. The new name will reflect an updated pasta menu, bringing the likes of crayfish arrabiata and mozzarella mezzaluna to high streets across the country. Chief executive Alasdair Murdoch said: "We're trying to say to people, 'Yes, we're great at pizzas, but we're also great at salads and pasta'." He hopes to boost pasta sales by seven per cent over the next fortnight by adding pasta dishes to Pizza Hut's takeaway menu. Theres nothing healthy about pizza hut! They make the greasyest pizzas ever! That's crazy. Everyone will still know what it is! I love pizza hut I dont care what they name it haha, as long as the food stays the same. did no1 watch channel 4 yesterday? every 2nd advert was a pasta hut one lol! I saw that, but just thought that they were advertising a new range!! !